Philadelphia was initially designed on a rectilinear street grid plan in 1682, under the directions of its founder William Penn. With broad streets intersecting at right angles and ample dedicated parkland, Penn envisioned that his plan would safeguard against overcrowding, fire, and disease, all of which plagued many poorly designed European cities. But as the town became crowded, especially after it was chartered in 1701 as a city, alleyways sprouted within and between larger blocks and the city took shape. 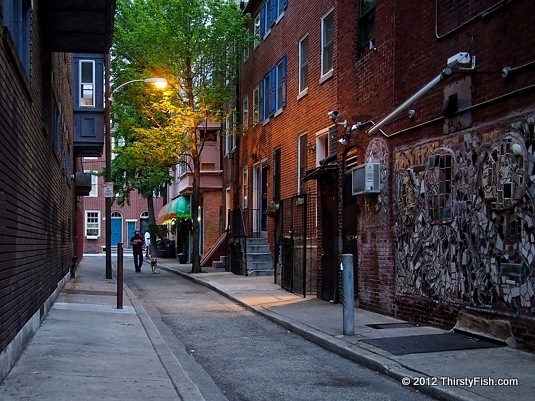 Many of these early "residential streets" exist to this day and give Philadelphia its characteristic historic feel. The pictured alley runs between South and Gaskill Streets. The artwork that you see on the right is a mosaic mural. Alleyways make good pictures.